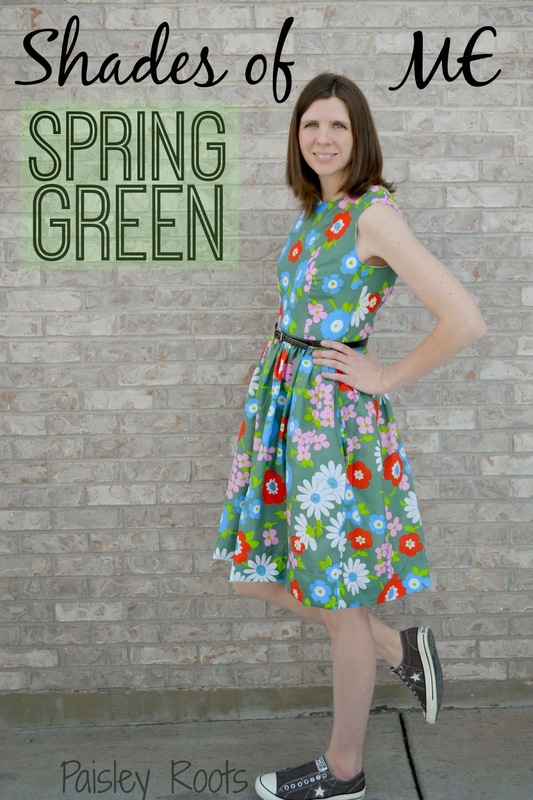 Paisley Roots: Shades of Me Spring Green! Shades of Me Spring Green! Quite a while ago, I got a message from a friend with a link saying, "Quick! Go sign up and I'll fill you in later!" So, I said, "OKAY!" and signed up! Later I found out that it was to the Shades of Me series and man I was stoked! There are some majorly awesome women participating in this and I was so excited to be in it with them! Then reality kind of hit me. I've made a couple of things here and there but I really haven't broken in to "ME" sewing. I've had this fabric for AGES and I've been waiting and waiting for the perfect thing to make out of it. I just LOVE the bright bold colors of the flowers on the background of green. Definitely screams "Spring" to me. About the converse shoes......yeah, I'm not a girly girl and you will never see me in anything fancier. But I can totally rock a dress with them. Ooh! And this dress has pockets! Great place to store my "stop the kids from screaming while in public places" snacks! I also used a regular green zipper rather than an invisible one. This pattern was perfect! Super easy to make and just the "ice-breaker" (bad pun cause I wish I could make all the ice and snow around me disappear) I needed into making stuff for me! 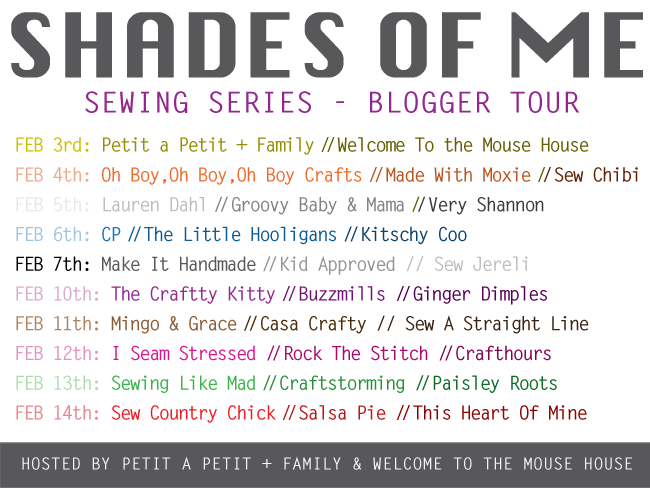 Go check out the incredibly talented Laura and Mie and the rest of the amazing women on this tour and link up with what you've been sewing! Wow Karly! This is such a gorgeous version of the Caroline dress, I want to steal it ;) I love it with the converse too (another non girly girl here). You should definitely sew for yourself more. i love that dress and love the shoes paired with it:) too cute! congrats on winning pr&p! love that last pic! so fun! and obviously a cute dress..
You never stop, do you? What a great dress Karly! Karly you look amazing!! I love love love that dress in that fabric and the fit on you is perfection...and the Converse are just a perfect pairing - no need to excuse that! And it might be the green getting the silliness out in us....or maybe silly people choose green? Love the Converse and what an adorable dress! And of course congrats on your PR&P win! You did so great. I so need this pattern!!! 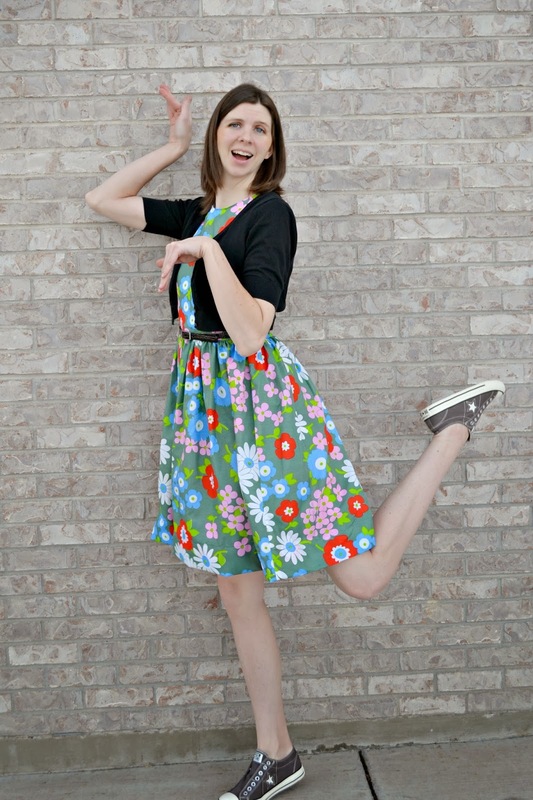 Your dress is adorable, Karly! The dress is so cute and you look amazing! I love the Converse too. You are so stinkin' cute! And I love the print on your dress. Green is my favorite color! You look adorable in the dress and the converse are perfect! So cute! I love this fabric. Spring is in the air. Great job! Awesome dress! And I love the converse too. Thanks for being on the tour and congrats on winning PR&P. Beautiful. I love the fabric and the dress is so pretty on you! I love how accessible you have made this Caroline. You look great and I love the converse with it. This dress is so perfect for the Summer. Love the dress, and the converse shoes... and the legs! You look awesome, Karly! Love the dress! This is SO SO beautiful and I am the same as you… not a girly girl at all… so I appreciate the converse 100%. haha. It is perfect on you! That last picture of you is amazing! I love this dress on you and your fabric choice is perfect. I'm a big green fan myself so I was very excited to see what was up for the color green day :) You did not disappoint. Super cute! 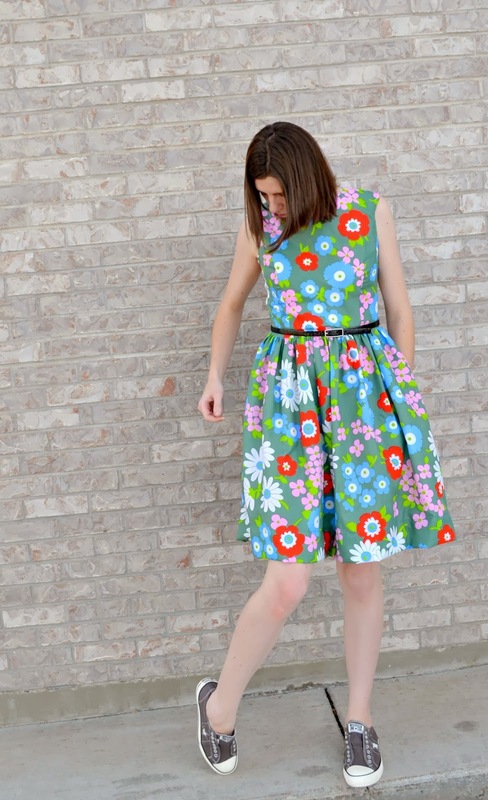 I love the fun floral print with the style of the dress. The dress fits you perfectly! Great foray into 'me' sewing! Such a perfectly fitting dress.